The 2018 Toyota Etios Platinum Edition is available to order for a limited time. Offers more goodies to its customers in terms of both visual as well as electronic upgrades. Toyota Kirloskar India Ltd showcased the Etios concept back at the 2010 Auto Expo. In the same year, December marked the launch of the sedan. The hatchback version named Etios Liva or Valco in Indonesia followed within six months. Since the past eight years, Toyota has offered its customers one mild facelift and two “special editions”. Most manufacturers, in that time span, delivers a new generation and a facelift of their products. 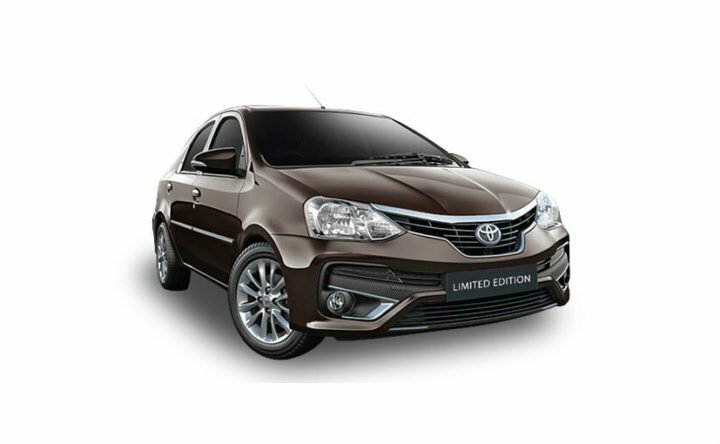 The Etios Liva based Liva Cross failed to charm customers as well and clocked the lowest of just 195 cars sold in a month in the entire nation. Does the 2018 Toyota Etios Platinum Edition will repeat its history or is actually something refreshing? Read along to find out. The 2018 Toyota Etios Platinum Edition is available to order on the VX trim on both the petrol and the diesel variant. The petrol variant costs INR 7.84 lakh ex-showroom Delhi, a difference of INR 21,000 from the standard model. The diesel version costs INR 8.94 lakh ex-showroom Delhi, a difference of INR 22,000 from the standard version. Considering the new paint scheme, your invoice already includes the painting charges. So for INR 21K, you get new seat covers and an upgraded music system that doesn’t support Apple Car Play or Android Auto! The new 2018 Toyota Etios Platinum Edition is the latest iteration of the Etios facelift that was launched last year. The Platinum Edition is available to order only on the sedan for now. Whether or not Liva will get it too? We don’t know yet. The limited edition offers its customers a new paint scheme i.e. Phantom Brown, otherwise available on the Fortuner etc. The interior upgrades include new dual-tone upholstery to match the exterior. A 6.2-inch touchscreen infotainment system replaces the otherwise aged unit. The system offers multiple inputs like Bluetooth, USB and AUX-IN. In addition to the inputs, it features voice recognition and remote control. What the system fails at is not offering Apple Car Play and Android auto. Comparing the infotainment system on the 2018 Toyota Etios Platinum Edition to some of its competitors, the Renault Kwid offers a 7.0-inch unit, the Maruti Dzire offers a 7.0-inch system too with both Apple Car Play and Android Auto. Also Read: 2018 Toyota Yaris Cross Launched In Japan, India bound? The recently launched 2018 Toyota Etios Platinum Edition features zero mechanical changes. Under the hood is the same 1.5-litre petrol engine and 1.4-litre diesel engine. The former makes 89 bhp and 132 Nm. The diesel puts out 67 bhp and 170 Nm. Comparing the petrol motor to the one on the Tata Tigor, the former delivers 84 bhp from a much frugal 1.2-litre petrol engine. Did you like the article? Do us a favour and rate the article below.